When assigning funds the " European Union must guarantee respect for freedom and human rights"
Fr. 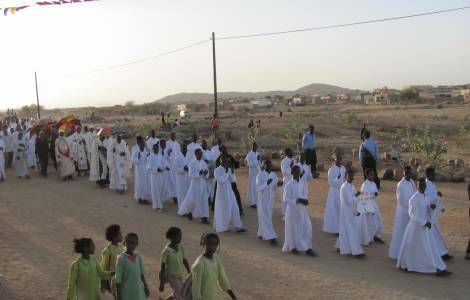 Zerai’s alarm: "The regime does not reduce pressure: it is a State-prison"
Ethiopia-Eritrea Agreement: the Church hopes for "a season of freedom and peace"
Asmara (Agenzia Fides) - The Catholic Church in Eritrea is experiencing a phase of waiting. After the peace agreement with Ethiopia, the situation has crystallized. On behalf of the authorities there were no particular repressions, but not even openings. Abba Mussie Zerai, priest of the eparchy of Asmara, describes the situation experienced by Catholics in the small country of East Africa to Agenzia Fides: "The peace between Asmara and Addis Ababa had raised great expectations - continues the priest - but there has not been a clear sign of improvement so far: the freedom of action for the Catholic Church is still to be conquered". Eritrea is one of the poorest countries in the world, with a GDP per capita of just $ 800 a year, which is less than $ 70 a month. Most citizens survive thanks to the money that comes from relatives who managed to escape and find work in Europe. In fact, one of the most significant voices of the national economy is precisely the small foreign capitals that come from Eritrean expatriates. The persistent drought and the general climate change of the region is causing a substantial permanent loss of natural resources. This only worsens an economic crisis from which there seems to be no recovery. According to the UNICEF data of June 2017, 22,700 thousand children under the age of 5 are in a state of acute malnutrition. Eritrea is also among the most militarized countries in the world and under special UN observation because of the systematically applied tortures to opposition and non-opposition prisoners. Human Rights Watch has defined that Eritrea "one of the most ferocious dictatorships in the world", which manages 361 between prisons and detention centers. Press freedom has also been penalized and there have been no foreign correspondents of the Western press in Asmara since 2010. The Church, in addition to pastoral activity, carries out numerous projects in the social field. It manages schools, clinics, dispensaries, medical centers and promotes activities to support the weakest (women who are orphans, people with AIDS and leprosy, poor people). In 1995 the authorities approved a law that transferred to the State all the social initiatives. Over the years, the law has not been implemented, but the Church risked at any time to see its activities expropriated. "The hope was that this law would be repealed - continues Abba Mussie - but, on the contrary, it is still in force. In some regions the governors, considering the great needs of the population and the shortcomings of public institutions, turn a blind eye and allow Catholics to continue their social actions, but in other regions they are constantly hampered, and as a Church we must live day by day and hope to be able to continue our work for the population". ASIA/PHILIPPINES - "A climate of intimidation in society towards the opposition, mass media, the Church"